Would nay one recommend a geothermal enginnering or contracting company who have experience in horisontal or Pond geothermal system. This is for a 48 unit residential project with an exisitng water pond that might be used in a geothermal heat pump system for HVAC and water heating in Goergia. I dont know why but I still dont see it anywhere. 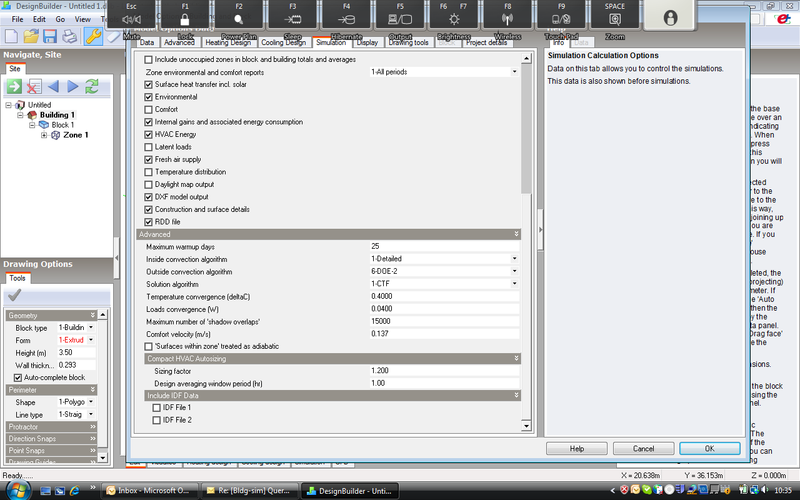 Is there some some other precondition within the program or model options for it to appear?? I could not find the input field for specifying velocity anywhere. Is it something to do with the version; I am using 2.0.4.002. And one more question: when we use the Operative temperature control in DesignBuilder, it takes radiant fraction of 0.5 by default, and its not possible to change it, am I right? Just to mention that in DesignBuilder, you can define the velocity to be used for the comfort calculations on the Simulation tab of the model options dialog, under the Advanced header. I tried changing from the default air velocity from 0.137 m/s to 2 m/s and obtained very different results for all comfort indices, including Fanger PMV. I am trying to model the impact of ceiling fans on thermal comfort in a warm-humid climate, for a naturally ventilated building. Intial simulation runs obviously show a lot of discomfort with PMV going upto 5.5 during peak summer. We want to model ceiling fans so that the impact of air velocity on thermal comfort is captured. Naturally this wont lead to achieving thermal comfort conditions in the space but we feel that it should at least result in PMV coming down to 4-4.5. I am not sure if doing this is possible in DesignBuilder but I think one can specify an object called AirVelocity schedule in EnergyPlus, where one can input air velocity in m/s in one of the fields (the current EPlus default being 0.137). I want to know that if we modify (increase) the value of air velocity to about 0.7 (for ceiling fans), would it be used for comfort calculations? I thought the Fanger comfort model algorithms use air velocity for calculations but I can't see that happening anywhere in the Eplus Engineering reference, which could also have been a resultant of my limited understanding of the subject matter. I also noticed that the Pierce model takes air velocity into account. Does this mean that we should rather look at the Pierce model rather than the Fanger model in order to arrive at an adaptive model of thermal comfort? What we basically want to do is to make sure that the increased air velocity is used for calculation of PMV in EnergyPlus to model the impact of ceiling fans. I would be really grateful for any help.